Tender, juicy pork chops that are seared and then baked in a garlic butter. 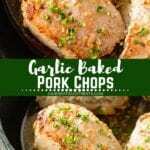 Grab your boneless pork chops and ingredients that you already have in your pantry and make delicious Garlic Baked Pork Chops recipe for dinner! 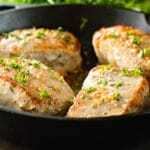 Tender, juicy pork chops seasoned with garlic and baked in butter. Drooling much yet? 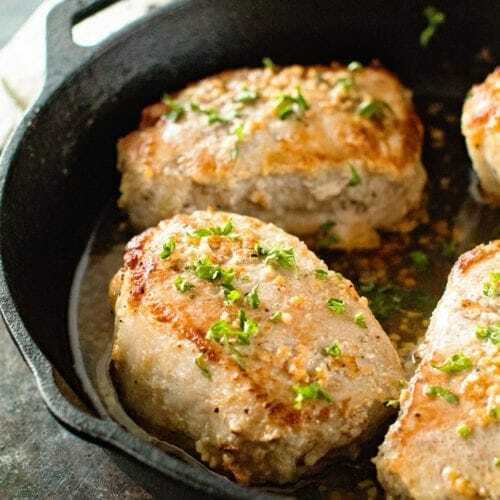 These boneless baked pork chops are amazing and such a delicious dinner recipe for a weeknight or you can serve them to guests because they’ll never guess there’s only a few ingredients! 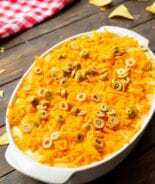 Serve it with mashed potatoes and green beans and you’ll have a delicious meal the entire family will love. It seems like pork chops are one of those meats that tend to get forgotten about. People have a fear of having tough, dry pork chops so they avoid making them. We personally love them! 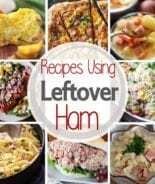 A few of our favorite recipes are Parmesan Crusted Pork Chops and Sheet Pan Parmesan Pork Chops and Vegetables. 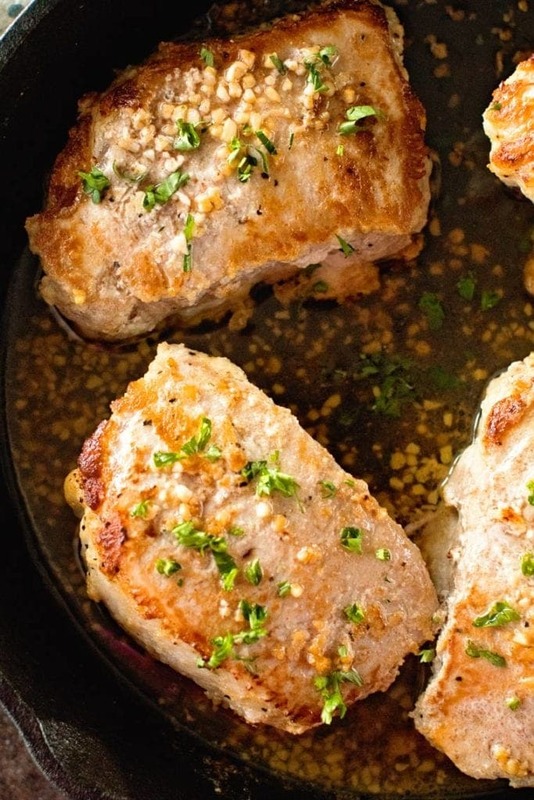 A new favorite is definitely on the horizon since I made these Garlic Baked Pork Chops! I personally love garlic so this was an obvious win for me! 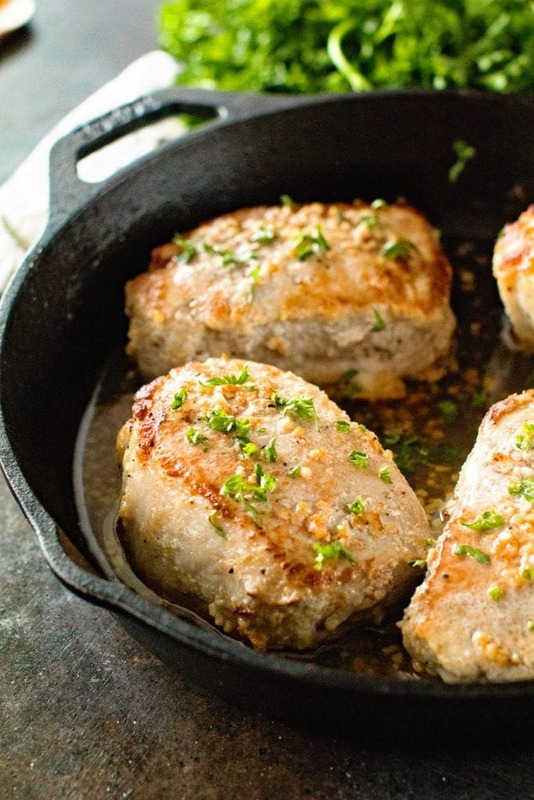 By searing the pork chops before baking them it locks in flavor and makes them so pretty too. Speaking of pretty and delicious pork chops. These pork chops came from ButcherBox. Ever heard of them? ButcherBox is pretty much the most convenient thing ever and every busy family’s dream come true! If you are reading my blog I’m guessing this just might be you! Have You Heard of ButcherBox? Does having a box of grass-fed beef, heritage breed pork and pastured chicken that magically show up at your door step every month (FREE SHIPPING) sound amazing? Think about how much that would simplify your grocery runs! Did I mention that it’s less than $6.00 per meal? Simple grocery runs are a must in my life, especially when dragging multiple children with…. If this sounds awesome you are going to want to make sure you sign up for ButcherBox! ButcherBox is a subscription service that you can schedule according to your needs. 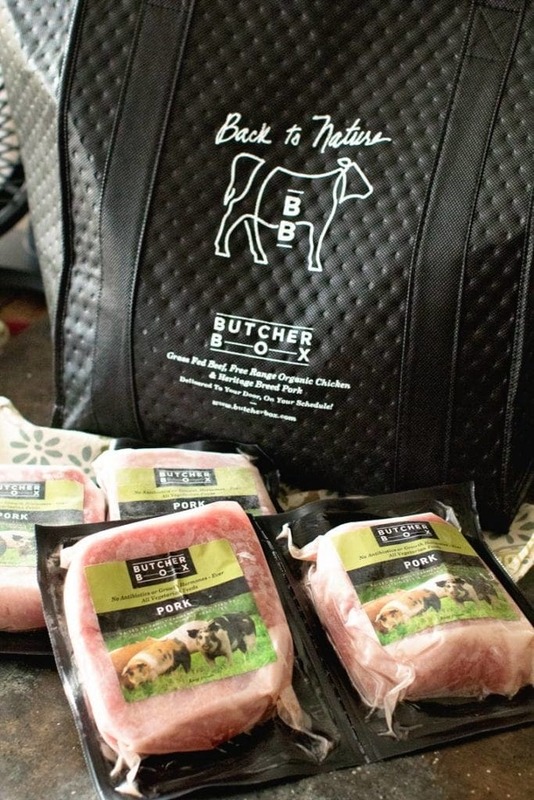 You can cancel your ButcherBox subscription at anytime, with no penalty. 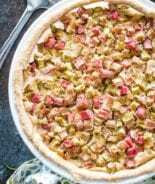 Their grass-fed beef, heritage breed pork, and free-range chicken selections are frozen at the peak of freshness and individually vacuum-packaged. It arrives to your door ready to store in the freezer until you’re ready to cook. Your ButcherBox is fully customizable. You’ll pick between two sizes and either let the ButcherBox team curate your monthly shipment for you, or personally select every cut that goes into your box. You can also add on helpful-to-have items like delicious pork breakfast sausage or boneless and skinless chicken breasts. We go through chicken like crazy so I’m always adding a few more packages on! Did I mention it all comes from small farms they partner with? As a farm girl I think this is AMAZING! Oh, wait I forgot to mention one of the best parts! They are partnering with me to offer you FREE Boneless Pork Chops + $10 Off and Free Shipping on your first order! 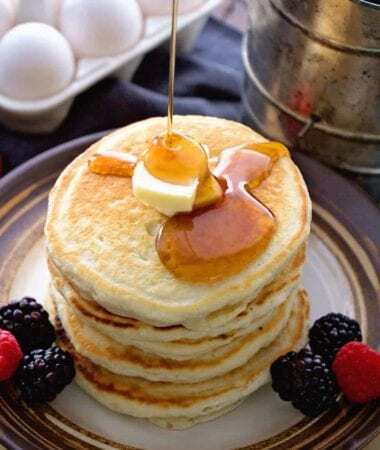 CLICK HERE TO GET STARTED WITH BUTCHERBOX TODAY! What do I need to Make Baked Pork Chops? The first step is to sear your pork chops before baking. I do this in my cast iron skillet and then transfer the entire skillet into the oven. This locks in the flavor of the pork chops while baking them. You do not need to sear them, but I highly recommend it. If you sear them it will impact your cooking time. A general rule for baking pork chops is 7 minutes of baking in a 400 degree oven per half inch of meat. Since we are searing them you reduce that amount by two minutes. Now, if you are using a bone-in pork chop, you might need to add a few minutes of cooking time. Your pork chops will be done when they reach 145 degrees F. Also, please remember to let your pork rest for 5-10 minutes before cutting it. First you will sear the pork chops on each side in a skillet. 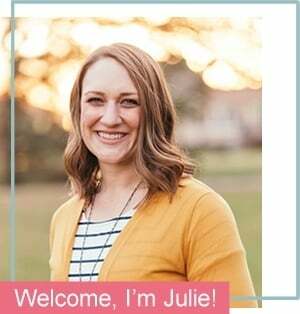 After that you will place them in the oven at 400 degrees F for about 20-25 minutes or until the internal temperature reaches 145 degrees F.
ButcherBox is a Julie’s Eats & Treats Affiliate partner, meaning we make a commission from purchases made via the links in this email. Thank you for supporting our Julie’s Eats & Treats partners. Tender, juicy pork chops that are seared and then baked in a garlic butter. 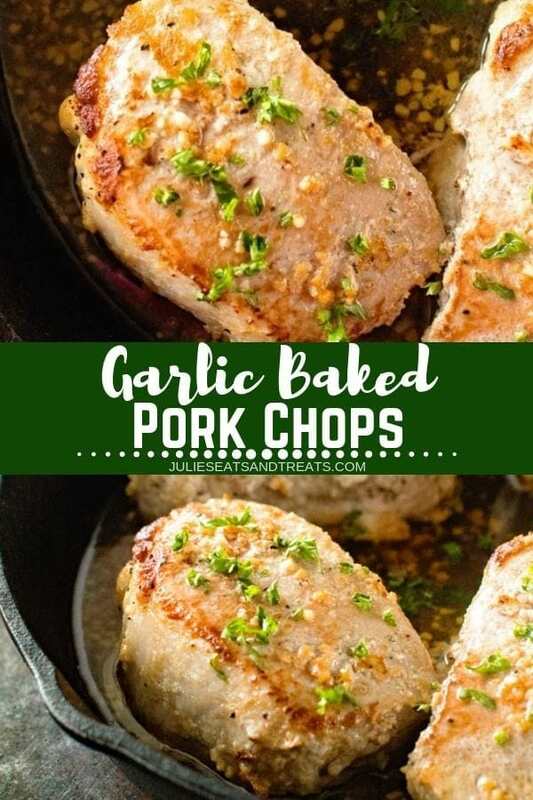 Grab your boneless pork chops and ingredients that you already have in your pantry and make delicious Garlic Baked Pork Chops for dinner! Mix together olive oil, garlic powder, pepper and salt in a ziploc bag. Add pork chops and mix until they are covered. Squeeze as much air out of bag and seal. Marinate in refrigerate at least 3 hours and up to overnight. When ready to make pork chops preheat oven to 400 degrees F.
Heat cast iron pan (or oven safe heavy pan) on medium high until very hot. Add butter to pan. When butter is completed melted and foamy add pork chops to pan. Do not crowd pork chops. Cook about 3 minutes or until browned on one side. Flip and repeat on other side. When you flip the pork chops add minced garlic. Spoon garlic butter pork chops as they cook. When pork chops are browned on both sides, transfer to oven and cook until internal temperature reaches 145 degrees F about 20-25 minutes. Do not over cook. Let pork chops rest 5-10 minutes before enjoying. approximately how long do you cook the garlic porkchops? 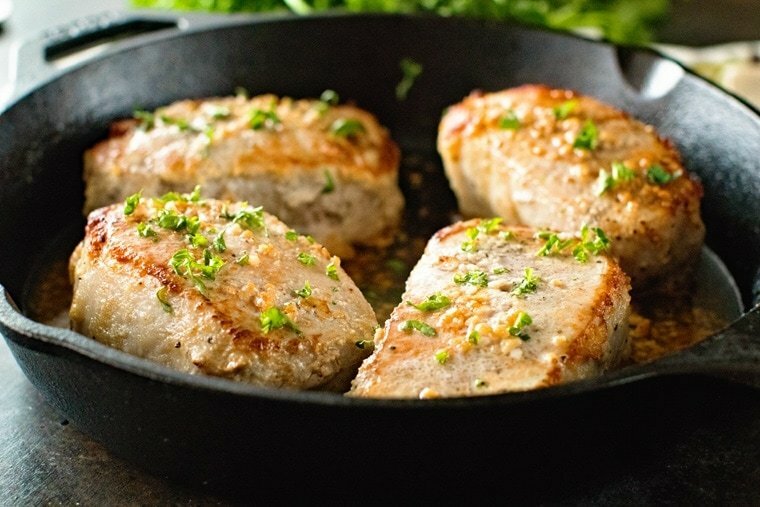 It is hard to beat good pork chops, and these look absolutely delicious! 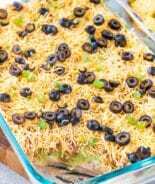 Such a great staple recipe! I am always looking for new pork chop recipes!! Thanks for sharing! So delicious and easy! Enjoy! Thanks for the tips! I had no idea how to bake pork chops! Also, that Butcher Box sounds like such a great idea! I will definitely have to check them out! So handy to have a stocked freezer! How do you keep the garlic from burning when in the oven? My garlic burnt and I had to scrape it off the pork chops, other than that they were moist. You could try cover it with foil when you put it in the oven? I never had that problem! What if you dont have time to marinate? Can you still do this recipe? You can you just won’t have quite as tender and flavorful of pork chops. What a fantastic dinner for the whole family. Love how you seared these juicy chops in garlic butter! Always a favorite at our house! Thank you for sharing your recipe! I love some butter & garlic! Can’t go wrong with that combo! So do I! Love having that freezer stocked! 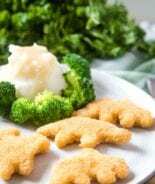 Such an easy and delicious weeknight recipe. Love how few ingredients there are! 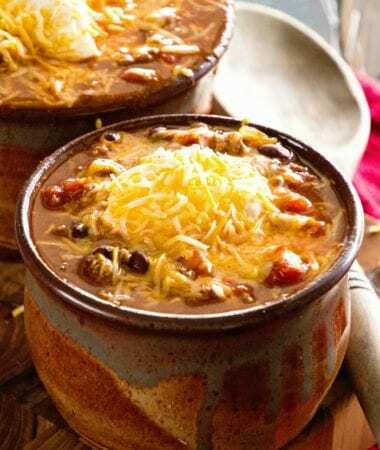 It’s one of my go-to recipes on my menu plan! In one part of post you say oven temp is 400 and then later you say 350. Print version also states 400. Just want to double check oven temp. 400… thank you for drawing that to my attention! One of the best pork chop recipes we’ve tried! Thank you! These are the best pork chops! Seriously easy and delicious! I will make this again and again! These sound and look amazing! Could you transfer pork chops and juice to a large dish? I have a family of 6 and none of my oven approved pans will hold 6 pork chops! DELICIOUS!! MOIST!! TENDER!! HAVE MADE THEM TWICE. YAY! So glad you are enjoying them. Thanks for leaving me a comment and rating! These were absolutely delicious! I did add some onion when I added the garlic just cause I like the combination but what an easy, flavorful recipe!